You can tastebud-travel all over Europe without leaving Glasgow, these days. Trust me, all true! Restaurants, bistros and cafes serve the best our European friends offer, and mix them up in a cool, cherry-picking kind of style. The results delight happy diners time and again. Glasgow takes its place on the world stage now. And the 2014 Commonwealth Games will shine a big spotlight on our great city. Its just as well locals - and visitors - know a good thing when they taste it! German sausages are rubbing shoulders (sort of) with French moules, all served up with Belgian fries. Scottish classics now find their way onto almost every menu. Scotland is an important part of Europe, after all. So haggis might be stuffed into a garlic chicken - yum! Feel like a venison tartlet to start, followed by coq au vin? No problem, madame. Or how about Scotch broth, spinach ravioli and garlic bread with tarte limone to finish. Your wish is my command, sir. What fun, and how Euro-cosmopolitan can Glasgow get? 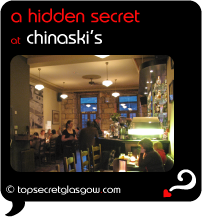 Chinaskis is easy to miss, bringing top-notch gastro-pub food, huge choice of bourbon , cool decor and laid back, funky beer garden to local fans. Guys combines pop art and the county floral look decor with worldwide food influences, bringing an eclectic, stylish menu to The Merchant City. The Arches Cafe Bar, hidden out of view in the buzzing Arches Theatre, delivers a quality show to remember, and wont break the bank. The Left Bank offers multi-level areas, classy, different menus and service with a happy smile, creating a laid back West End eating space. Great news! Finding this page means you can now join our VIP list for EAT Modern European. Time to grab your very own page for EAT Modern European. Do you have a special story about a time you decided to EAT Modern European? A funny experience? A grand occasion? A funky photo? A personal tip? A top secret?